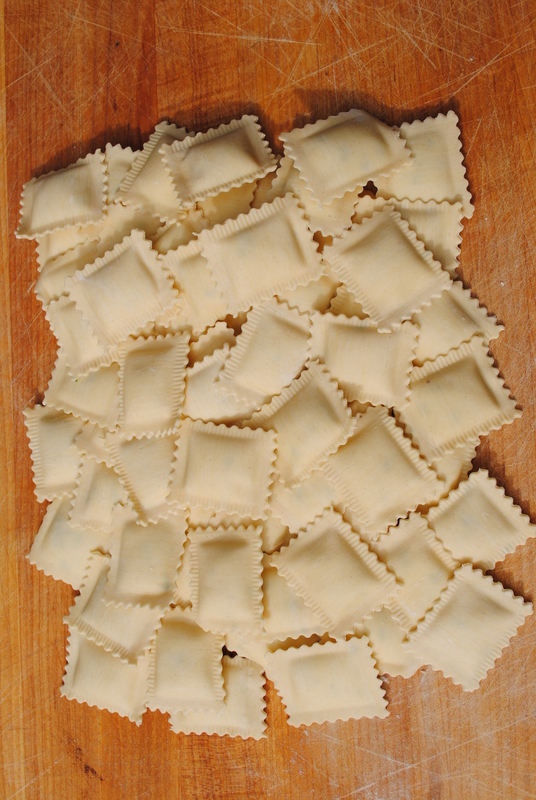 We are so proud to make this ravioli using Smoked Salmon from our friends at Wilson’s Fish. Those guys are so great, go by at any of their farmers markets that they attend and you are sure to get a sample of their wonderful Smoked Salmon, but also a warm welcome and a couple laughs! The filling includes ricotta, leeks and parsley. We enjoy serving this pasta with sautéed cherry tomatoes. Take a pint of locally grown cherry tomatoes slice in half. Add them to a hot pan with a drizzle of olive oil and an uncut clove of garlic. Cook down the tomatoes until they have released most of their water. Add a splash of white wine. From here you can add what you like, for example parsley, and/or cream to create a simple but delicious sauce.